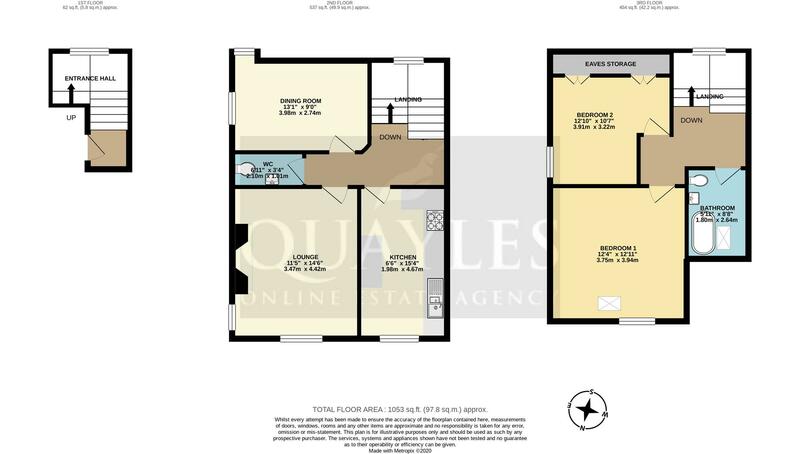 Spacious Second Floor Duplex Apartment. Short Walk to Douglas Town Centre & Promenade. Pleasant Outlook Over Woodbourne Square Gardens. Bright & Spacious Lounge and Dining Room / Bedroom 2. Fitted Breakfast Kitchen and Cloakroom WC. 2 Further Bedrooms and a Good Sized Bathroom. Private Parking Adjacent to Property. Travelling out of Douglas via Victoria Road, continue through the lights onto Bucks Road. 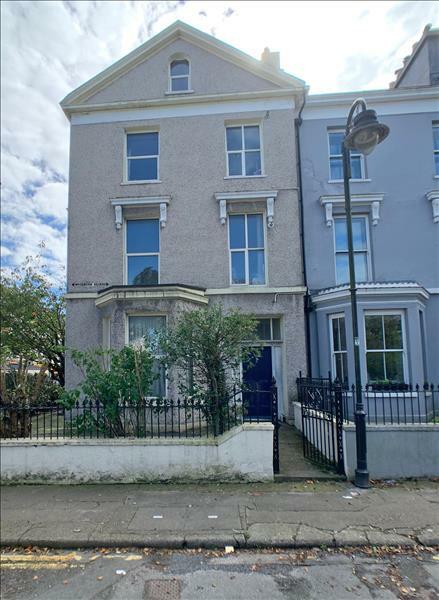 The property is conveniently located on the first left hand corner, just after the Prospect Terrace Shops and enjoying fabulous frontal views over the well kept Gardens in Woodbourne Square. A rare opportunity to purchase a superb Duplex apartment which combines spacious accommodation with a terrific view and a pleasant location close to all amenities. Viewings most highly recommended. Communal entrance area. Stairs to the upper floors. Private entrance area with coved ceiling, wood effect laminate floor covering and coat hooks. Staircase with window and fire escape at the half landing continues to the upper floors. Coved ceiling, wood effect laminate floor covering. Entry phone. Power points. Stairs with telephone point, window and fire escape at the half landing continue to the third floor. Attractive open grate fireplace with polished wooden surround. Dual aspect windows, the front enjoying superb views across Woodbourne Square Gardens. Television, satellite and telephone points. Coved ceiling. Currently used as a bedroom. An exceptionally light room with dual aspect windows. Coved ceiling. Fitted with a good range of medium oak fronted wall and base units together with complementary work surfaces and background tiling. Inset 1 1/2 bowl sink with mixer tap. Built in oven with four ring gas hob and extractor. Plumbed for a dishwasher and washing machine. Space for a fridge freezer and small breakfast table if required. Wall mounted 'Vaillant' gas fired combination boiler. Window to the front elevation enjoying garden views. Coved ceiling. Fitted with a white WC and wash hand basin with mirror over. Coved ceiling. Extractor. Main landing with coved ceiling and exposed beams. Smoke detector. Window over looking Woodbourne Square Gardens. Deep set, built in cupboard. Ample space for wardrobes, drawer units etc. Exposed beams. Reduced height to one side. Telephone point. Extensive eaves storage areas. Window to the side. Exposed beams. Coved ceiling. Fitted with a white suite comprising a free standing roll top bath, pedestal basin and WC. Ample space for storage units. Exposed beams and sloping ceiling. Extractor. All mains services are installed. uPVC double glazing to windows. Gas fired central heating. Leasehold - remainder of a 999 year lease. Active management company with fees set at £65pcm.